Recognized among the Top 200 Advertising Photographers in the nation, and invited to join the exclusive Canon Explorers of Light. 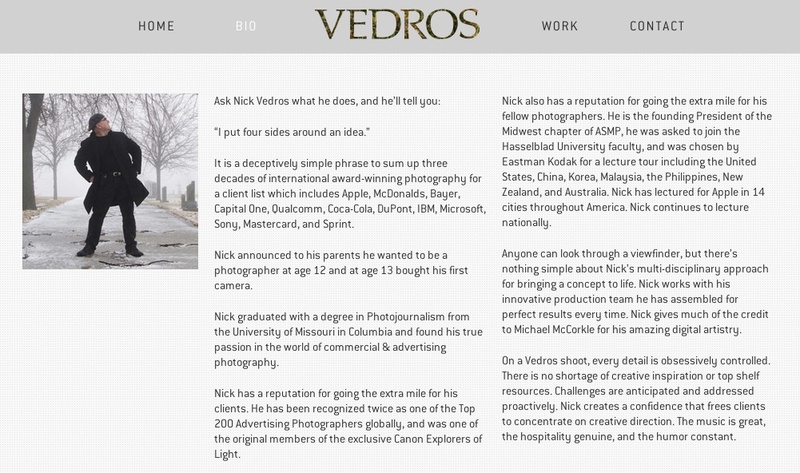 Nick’s career encompasses three decades of international award-winning photography for a client list which includes Apple, Bayer, Capital One, Coca-Cola, DuPont, IBM, Kodak, Microsoft Sony, and Sprint. He founded the Midwest chapter of ASMP, was one of only two American photographers selected to join the Hasselblad University faculty, and was one of three photographers chosen by Eastman Kodak for a lecture tour including the United States, China, Korea, Malaysia, the Philippines, New Zealand, and Australia. Nick continues to lecture nationally on behalf of Kodak and Apple. I worked with Bob to write website copy that repositioned him as a shooter with modern architectural lifestyle sensibilities. Within 4 months of website launch, Bob had been contacted by dream clients Herman Miller, The Land of Nod and Target’s creative group in Minneapolis. Susan Bradley learned that she’d become the first Minnesota designer to be recognized with an International Fashion Institute Award. The awards ceremony was held at the Walker Museum. The Fashion Institute’s theme for the evening was “A Gathering of Stars”. I crafted an acceptance speech tailored to Susan’s objectives: to honor the clients, colleagues and friends who had supported her work, and to reflect the evening’s theme. I see inspirational and esteemed colleagues, generous and loyal supporters, and very dear friends and family. is an extraordinary honor for me. it is my deep privilege to be a member of this organization. have been my support and my inspiration. and your presence in my life is a gift for which I’m endlessly grateful. Fashion, no matter how beautiful, is not truly meaningful unless it is worn. there is no greatest compliment you could pay me. your love gives wings to my dreams. From where I stand, it is all of you who are the stars this evening.